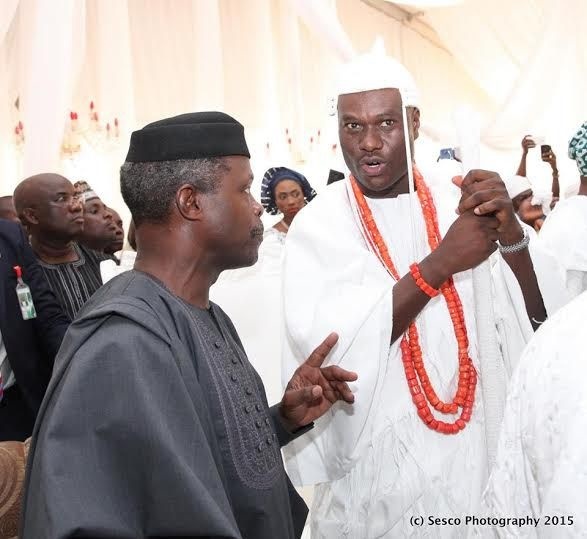 Prof. Yemi Osinbajo and the Ooni of Ife. Nigeria’s Vice-President, Yemi Osinbajo and the Ooni of Ife, Oba Adeyeye Ogunwusi have something in common. They have both been adjudged to have been committed to building African values, economic development, youth empowerment, community and educational development, humanitarian services and efforts at building peaceful coexistence. Therefore, they are nominees for the 2018 edition of the prestigious African Value Awards (AVA). Amb. Daniel Obah, Chairman Planning Committee of AVA 2018, revealed this in Abuja on Friday. According to him, other Nigerian nominees for the continental award, which will hold on November 17 in Abuja, include: Nigerian Business mogul and Philanthropist, Arthur Eze, Gesi Asamaowei and Davematics Ombugadu. For the Ooni of Ife, he would be honoured with the “African Tradition Icon of the Year” award, for his commitment to preserving African culture and values with his exalted throne. Some entrepreneurs and corporate bodies are also listed on the honour roll for their contribution to the economic growth of the continent.